Pianist David Kikoski, who's partnered so ably on past Criss Cross albums with hornmen like Alex Sipiagin, Seamus Blake, Conrad Herwig and Wycliffe Gordon, is perhaps best known for a series of compelling trio albums he's recorded for the label over the past decade. On each, he's been backed by some of the era's most talented and intuitive rhythm players. 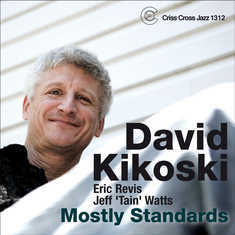 Now along comes Almost Standards, David's latest venture, on which he mixes it up with bassist Eric Revis (whose resume includes work with Betty Carter, Louis Hayes, Billy Harper and a bunch of Marsalis family members), and much-in-demand drummer Jeff "Tain" Watts (now with Branford Marsalis), and an invigorating presence on two earlier Kikoski CDs. The new album's hints at a mix of material serving as take-off points this time out: harmonically intriguing tunes that are already standards - probably ought to be.